These cookies are very simple, including the blackboard. I sometimes think I should have called my blog "Sue's Simple Sweets"! Candy eyes and edible markers help speed the cute cookie process along. Roll out sugar cookie dough. Cut out cookies with cutters and use spatula to transfer to baking sheet. Bake according to directions, until cookies start to brown around the edges. Tint a portion of the royal icing red and outline the apples with a #3 tip. Allow the outline to set for about 15 minutes and then fill in the apple with the red royal icing. Tint a small portion of the royal icing, brown, and outline/fill in the stem. Tint a small portion of the royal icing, green, and outline/fill the green leaves. Let the cookies dry for 6-8 hours or overnight. Apply the white accent line on the apples using a small ( for food only) paint brush and white gel food coloring. With the wooden end of the paintbrush dab a small dot of white gel on each candy eye. Dab a small amount of white royal icing on the back of each eye and place on the apple. Using the brown edible marker, draw lines on the stems for detail. Finally, use the black edible marker for the facial details and the stitching around the leaves. Cut out cookies with a plaque cutter and transfer to baking sheet with a spatula. Place baking sheet in freezer for 10 minutes. Tint royal icing, black, and outline/fill cookie with black royal icing. Let dry completely, 6-8 hours or overnight. 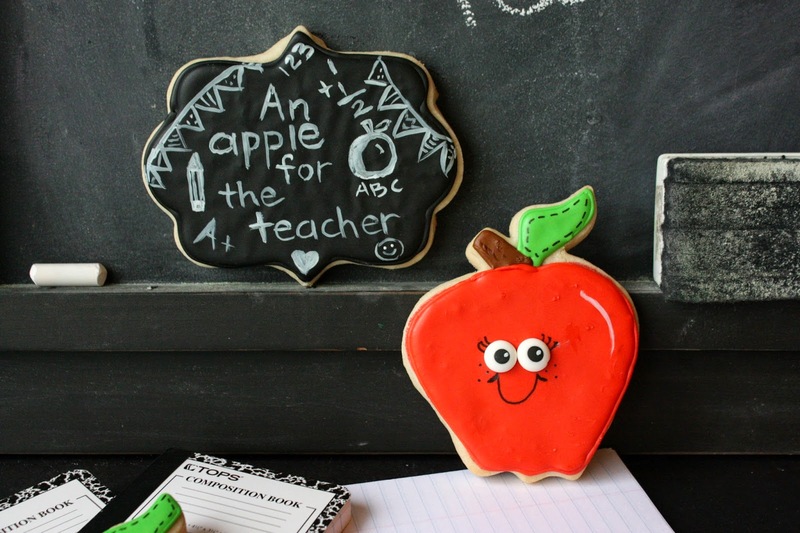 Use a small paintbrush (for food only) and white gel food coloring to add "chalk" designs/writing on the cookies. 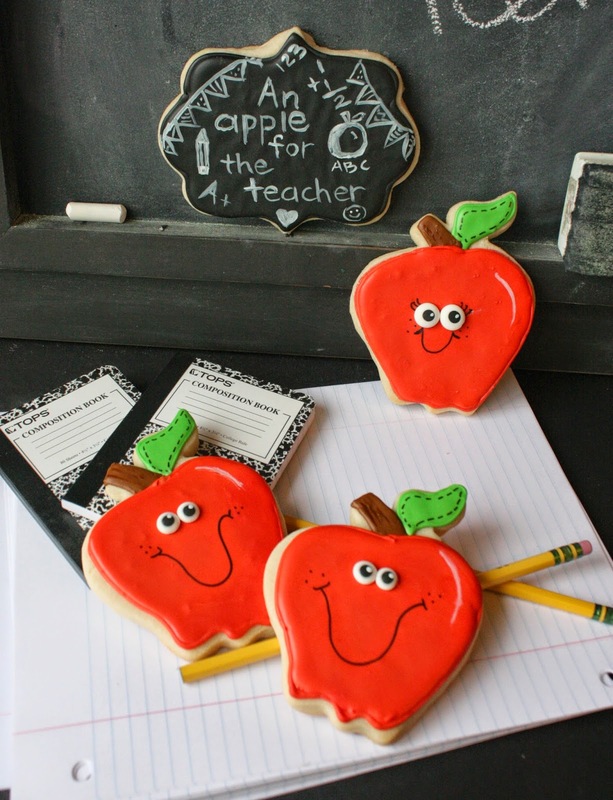 Make these cookies and sweeten a teacher's day! How beautiful!! These are just the cutest little cookies! Beautifully decorated! They are so beautiful, Sue. I love particularly the blackboard one..so fun! These are too cute! I especially love the one with the itty bitty smile. So sweet! You are killing me with cuteness Sue! I love the faces. I think any teacher would love to give these cookies an A+. Pinning now!